1,811 years had passed. It was the longest recorded expulsion of a people from their homeland. In 70 A.D. the Roman general Titus breached the walls of Jerusalem, and destroyed the Temple (just as Jesus prophesied). Over one million Jews were killed. Many were taken into slavery. Years later, from 132 – 135 A.D., the Bar Kokhba Revolt resulted in many more deaths, and Jews were officially barred from entering Jerusalem. Countless generations would pass in those years known as the diaspora, never experiencing a world in which Israel would exist as a nation on the world’s stage. But, things were about to change. Jews, and the world, would soon witness a miracle. It was November 29th, 1947. Millions of Jews all over the world collectively held their breath for the longest three minutes of their lives. Then came the moment! Those three minutes, broadcast from Flushing Meadows, New York, would change the world. The words heard from the U.N. reverberated throughout the Jewish world. “The resolution of the Ad Hoc Committee for Palestine, was adopted by 33 votes, 13 against and 10 abstained.” This was all the Jewish people needed to hear. Tears of joy, hugs of relief, dancing in the streets, and shouts of victory took place in Jerusalem and among Jews worldwide. Those who scoffed at the validity of Scripture based upon Israel’s non-existence as a world nation, would be silenced as the unthinkable – the impossible took place. The final count determined that Israel would once again exist as the Jewish homeland! 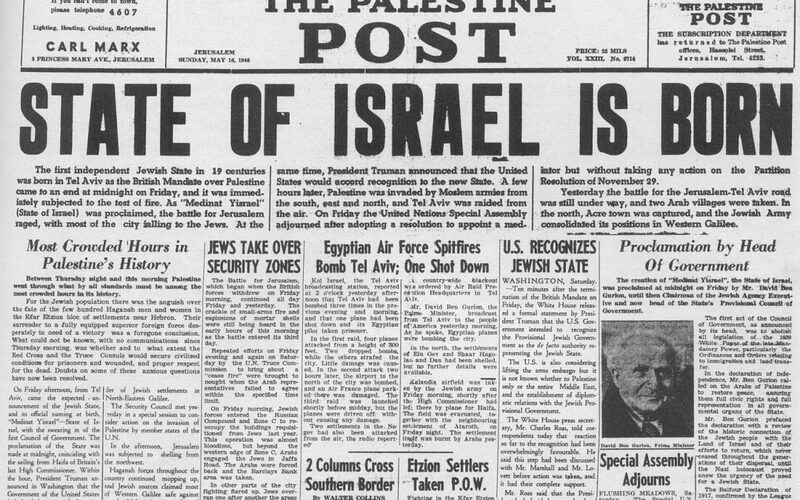 The time spoken of throughout the Scriptures as “the last days” would soon commence as a result of this resolution, as the modern nation of Israel would be born in less than six months from the passing of the Partition Plan! Mr. JAMALI (Iraq): … We believe that the decision which we have now taken … undermines peace, justice and democracy. In the name of my Government, I wish to state that it feels that this decision is antidemocratic, illegal, impractical and contrary to the Charter … Therefore, in the name of my Government, I wish to put on record that Iraq does not recognize the validity of this decision, will reserve freedom of action towards its implementation, and holds those who were influential in passing it against the free conscience of mankind responsible for the consequences. Amir. ARSLAN [Syria]: … Gentlemen, the Charter is dead. But it did not die a natural death; it was murdered, and you all know who is guilty. My country will never recognize such a decision [Partition]. It will never agree to be responsible for it. Let the consequences be on the heads of others, not on ours. R. H. Prince Seif El ISLAM ABDULLAH (Yemen): The Yemen delegation has stated previously that the partition plan is contrary to justice and to the Charter of the United Nations. Therefore, the Government of Yemen does not consider itself bound by such a decision … and will reserve its freedom of action towards the implementation of this decision. The new nation would face a multi-front attempt to obliterate it just as she was taking her first breath, but God miraculously delivered her again, and again. As we look back to this monumental date in the history of our planet, what should it mean to us, especially as we come upon the 70th anniversary of this resolution? The five to seven million Jews that the Holocaust left alive wouldn’t have agreed with that statement on November 29th, 1947! In fact, I would argue that those listening to that nail-biting three-minute broadcast probably felt very much like the Jews in Moses’ day, or those of the Babylonian captivity, who in 536 B.C. heard of Cyrus’ proclamation! We have Moses’ God! We have Daniel’s God! He is the same yesterday, today and forever! “By the rivers of Babylon, there we sat down, yea, we wept, when we remembered Zion. The Jewish people – who had been without a homeland for over 1,800 years would once again be a nation; they would once again have a home! Attempt to place yourself in the sandals of one of those captives, of those who were expelled from Israel in the 2nd century A.D. Can you imagine what it would feel like to be forcibly removed from the United States as its nationhood was utterly disposed of by outside forces? What if you, and your descendants, would subsequently remain in exile from your homeland for the following 1,800 years? This was a miracle of “Biblical proportions” for sure! Try to remember, and meditate upon the inseparable connection that the Jew has with the land promised to him by no other than God Himself! Dwell upon the promise that God made regarding this land, and her immutable tie she has to Abraham’s promised children, the Jews! What an amazing miracle has occurred, when this land was decreed to return to their hands! God keeps His promises! The prophet Isaiah proclaimed that one day, Israel would be gathered again from all nations from which she had been driven! This return, Isaiah’s promised second time, can, at the very least, be dated with the creation of the State of Israel, which corresponds to the passing of UN Resolution 181, 70 years ago this year! The above passage was obviously not speaking of the Babylonian captivity, as multiple nations are referenced, as well as the statement that God will be bringing His people back to the land the second time. Currently, more than half of the Jewish people in the world reside in Israel! What a fantastic, seemingly impossible fulfilment that took on life with this resolution, and will culminate with the second coming of Jesus! If God can do, and still does, amazing works as He intervenes in the lives of men, to bring flesh and muscle back onto the dry bones of the nation of Israel for example, He can certainly give us grace sufficient for today! He is all-powerful. We can’t help but remember this when we view the wonders He has performed in bringing Israel back onto the world stage after almost two thousand years. The proverbial domino fell 70 years ago which certainly set things in motion for the worldwide return of the Jewish people to the land of their fathers, Israel. The stage is being set right now for the 7-year Tribulation period, and the second coming of Christ. The rapture of the church precedes the Tribulation period. I am not attempting to “set a date” for these things to occur as many erroneously have done, but I believe that through the events that have taken place in the last century regarding God’s chosen people, we can tell the season. God’s timetable is certainly winding down. Have you lived for Him, and followed His Word? Do you have loved ones who have yet to trust Him? Do you have ought between you and another? Has God called you to do something that you’ve been avoiding? You may not have long to course correct, and make things right. The very same God who created the universe, parted the Red Sea, and walked on water, allowed those 33 nations to give a “yes” vote, and change the world. He is sovereign and has a plan. He keeps His word, and fulfills His promises. The return of Christ, and the end of the world is every bit as certain as the existence of the nation of Israel. He is coming. Are you ready? Why hasn’t Jesus returned yet? Longsuffering. The Father is waiting. He doesn’t desire that any face His holy wrath against sin. That is why He sent His Son. Jesus took all of God’s wrath on the cross. His blood was spilt for all. It is sufficient for all – but only effectual for those who turn from their sin, and receive Him as Savior. God doesn’t want you to be separated from Him eternally. How badly does He want you to be with Him? He sacrificed His only begotten Son to keep you out of hell. If we correctly view the nation of Israel as God’s timepiece, we don’t have long left. Won’t you trust Him today?